As emergency coordinator and field director with the Irish aid organisation GOAL and then Head of Emergencies at WAR CHILD, Johnie accumulated 14 years’ humanitarian aid experience in conflict and post-disaster zones in countries such as Angola, Sudan, Somalia, Ethiopia, Afghanistan, Rwanda, Kosovo, and East Timor. Johnie is the founder of No Strings International, and directs the field and program development work from Newcastle-Upon-Tyne in the UK. Kathy has been involved in puppetry for over 35 years. Although she came to it late and by accident, she landed in the sweet spot in puppetry when she was hired by Jim Henson on the Muppet Movie. She ended up as a core Muppet performer for 10 years. Among many roles, she played leads in the classic Henson / HBO series, Fraggle Rock and Jim Henson’s fantasy film, The Dark Crystal. Post Muppets she continued in television puppetry and began to write and direct. She was a co-creator, puppet producer, director and principle puppeteer on the PBS reading series Between the Lions. She now writes and directs for No Strings. Bryan Davis is a prolific entrepreneur and inventor. Most recently he solved a 100 old chemistry problem, successfully recreating 20 year old aged rum in a lab reactor (an invention poised to revolutionise the industry). On the side, he is working on a drug discovery project that's currently in compound isolation phase. The hook ― Davis has an art degree. Everything else is learned from Google. He runs his skunk works style project from rural California. The Kavli Professor of Computer Science at Harvard University and a core faculty member of the Wyss Institute for Biologically Inspired Engineering. She leads the Self-organizing Systems Research Group (SSR) and her research combines computer science, robotics, and biology. Her main area of interest is how cooperation can emerge or be programmed from large groups of simple agents. Recent work includes the Termes robots for collective construction and the Kilobot thousand-robot swarm (published in Science Magazine 2014, and chosen as one of their top ten breakthrough articles this year). In addition to creating new robots with her research group, she enjoys painting, dancing, and celebrating her family's indian and Caribbean cultures. Martijn is academic director at the Erasmus Happiness Economics Research Organisation (EHERO), a multidisciplinary research centre based at the Erasmus University Rotterdam with subjective enjoyment of one’s life-as-a-whole as conceptual focus. The ambition of this organization is to contribute to greater happiness of a greater number of people by researching how greater happiness can be achieved. For 19 years the In Motion School of Dance has been providing Bermuda's best dance and performance training for local dancers. They have regularly organised events of many kinds including an annual Dance Showcase and their Holiday Nutcracker Spectacular. Stuart is founder of Trunomi a start up in the field of Personal Data and Privacy. Published in Forbes, American Banker, FinExtra and Startup Collective; named by Bank Innovation as one of the 2015 Innovators to Watch - CEO’s who are Changing the Future of Banking. A multiple award-winning Member of the Young Presidents Organization; the Young Entrepreneur’s Council and The Institute of Directors; as well as a graduate of McGill University and the inventor of a number of industry defining patents all relating to the creation, sharing and monetization of customer data. 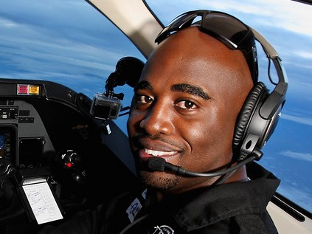 In 2007, 23-year-old Captain Barrington Irving secured his place in history as the youngest person and first black pilot to fly solo around the globe. On his 97-day journey, he flew 30,000 miles in a single-engine aircraft called Inspiration, encountering thunderstorms, snow storms, icing, sand storms and monsoons along the way. His purpose in making the trip was to show other youth that if they he could achieve his dream, they could too. He is the founder of Experience Aviation. Creative director of Jim Henson Productions (The Muppets). There, over twenty-plus years, he designed scores of characters and settings for television and film, became Executive Vice President of the company and was co-creator, Executive Producer, and/or creative director on numerous, multi-award-winning projects from television series and specials to books, toys, games, albums, stage shows, parade floats and whatever else came along. In 1996 he left Henson to become one of the creators, and Emmy-winning Conceptual Designer, Creative Director and Executive Producer, of the PBS literacy series, Between the Lions. Following 9/11, he and his wife Kathryn Mullen with Irish aid worker Johnie McGlade founded No Strings, an NGO which has produced life-saving videos for children in Africa, Afghanistan, Haiti, Syria and throughout the Pacific rim. Tom is CEO and founder off EV Grid, Inc., a Palo Alto, CA company that develops and supplies technology for integrating electric vehicles, batteries and the power grid. Before EV Grid, he was CEO of AC Propulsion Inc., a leading supplier of electric vehicle technology based in the US and China. AC Propulsion provided the inspiration and technology that lead to Tesla Motors. Clilly is CTO and co-founder of Audience Entertainment. She is a pioneer in crowd gaming and has extensive technical and management experience in computer vision, real-time animation systems, real-time interaction systems with virtual characters, and design and production. A writer of all genres. She has self published two poetry collections, illustrates an online comic strip and has been published in various journals. Holding a Bachelor’s degree in Music Composition, Yesha balances her time between writing music and writing words. A self proclaimed ‘part-time cartoonist’, she also claims discovery of the persona of Po=t, a cartoon who while very self aware, is unaware that she is two dimensional and thus not human. Po=t wanders through life on a never-ending quest for inspiration. While possessing much aptitude, precocity and dedication, there is no substantial proof of Po=t actually authoring any poems. Most of her time is spent assuring people of her writing vocation. She does not credit Yesha Townsend with her discovery, as she is convinced she is a human. She believes she is very cute. Martha is Executive Director and founder of The Family Centre. Established in 1990 as a Bermuda-based registered charity, its goal is to provide therapeutic, clinical, wrap-around services to children and families in crisis. She has served as Chairperson for the Performance Committee on the Bermuda Government SAGE Commission, as well as on the Board of Education, the XL Foundation and the Bermuda National Standards Committee. She is founder and Chairperson of the Inter Agency Committee for Children and Families and is Co-chair of the Inter Agency Gang Task Force Community Response Team. In June 2002, Martha received The Queen’s Certificate of Honour in recognition of her efforts on behalf of children. In 2015, she received the Cablevision Rollin R. Nathan Community Service Award for Outstanding Service in the Community. The next event took place at the Fairmont Southampton on October 10th, 2015.